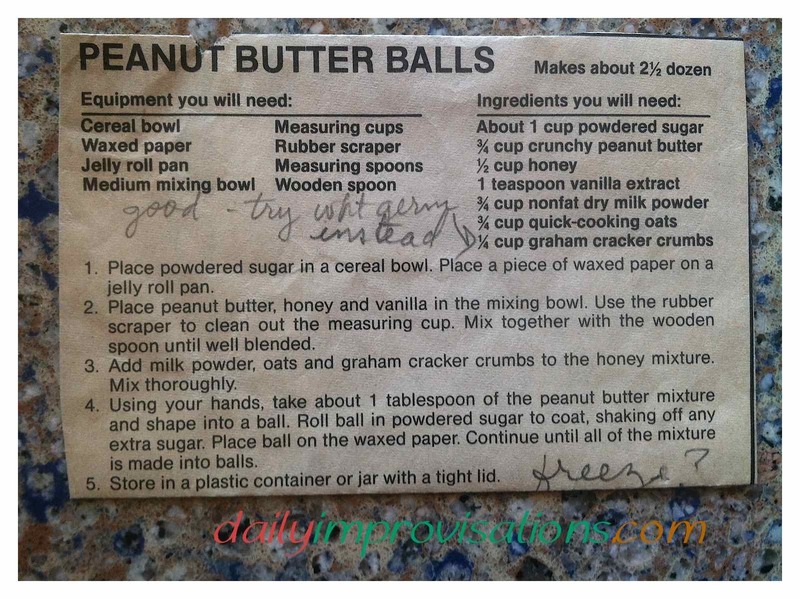 The original newspaper clipping recipe from about 25 years ago. 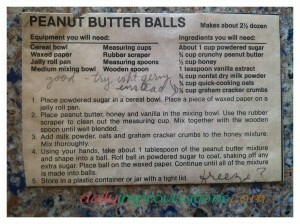 All the ingredients for the Yummy High Energy Peanut Butter Snack Balls are mixed here, except for any chocolate. 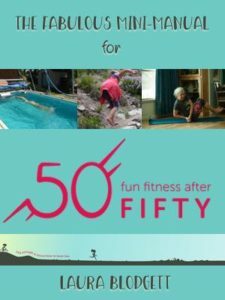 3/4 cup chunky peanut butter – I used Skippy. We use natural peanut butter sometimes, but I find myself avoiding eating or cooking with it because of how it separates or gets hard in the refrigerator, so I often revert back to Skippy. 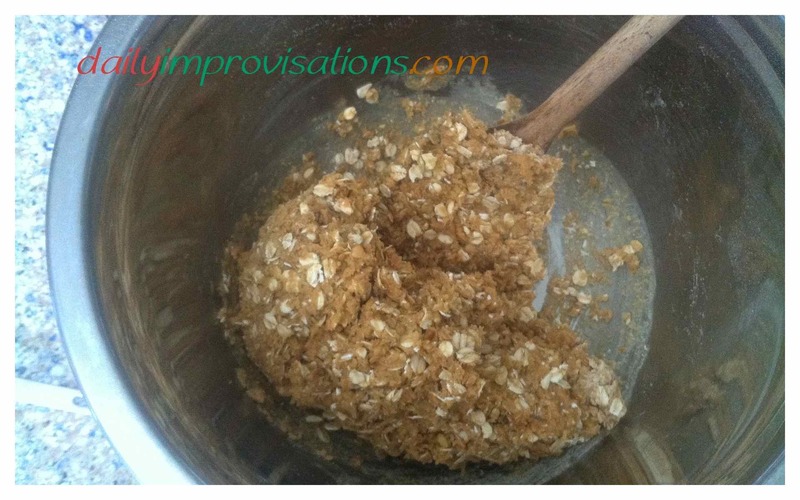 Add the dry ingredients to the creamed ones and stir well. It didn’t take very long at all, even though it seemed stiff at first. Then I thought of chocolate, because one should always consider if it can be added to a snack, breakfast, beverage, or dessert recipe … I was pretty sure chocolate chips would be too big. I didn’t want to mix in cocoa powder. There were some Scharffen Berger Cacao Nibs in the pantry, one of the two bags of them I had ever purchased in my life. We had used the first package quite some time ago, but hadn’t figured out how to try the second one. I couldn’t even remember what size “nibs” are. Upon opening the package, I found they were basically finely chopped cocoa beans. Unsweetened. Okay. Chocolate tree nuts or not, I wasn’t ready to risk making the whole batch with the nibs, being concerned they might be too bitter. 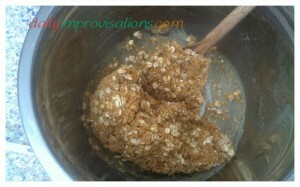 So, I started forming the mixture that I had into balls. 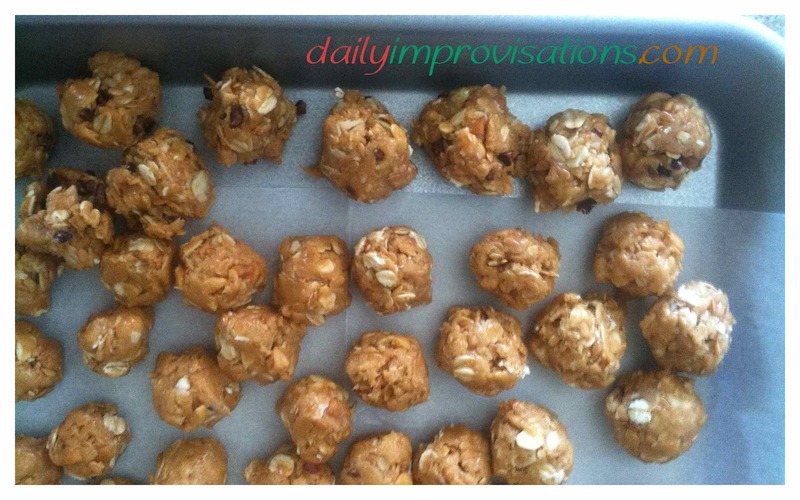 The original recipe specified using a tablespoon of peanut butter mix for each ball. However, when my 2 year old grandson asked for the first one right as I was making it (he could see clearly what I was doing from his little chair hanging on the kitchen counter), I knew I didn’t want to give him one that size. It was immediately sized down to about 1/2 inch diameter. Approximately 1/2 – 3/4 inch in diameter. I made myself one next and realized that was a very handy size. It might take a bit more time to form them all, but I would be glad later. I kept forming them and my grandson kept asking for more. He was lightening fast popping them in his mouth, then making audible mmmm noises, nodding his head, and smiling. I nibbled on a couple more, too. Putting in the cocoa nibs. 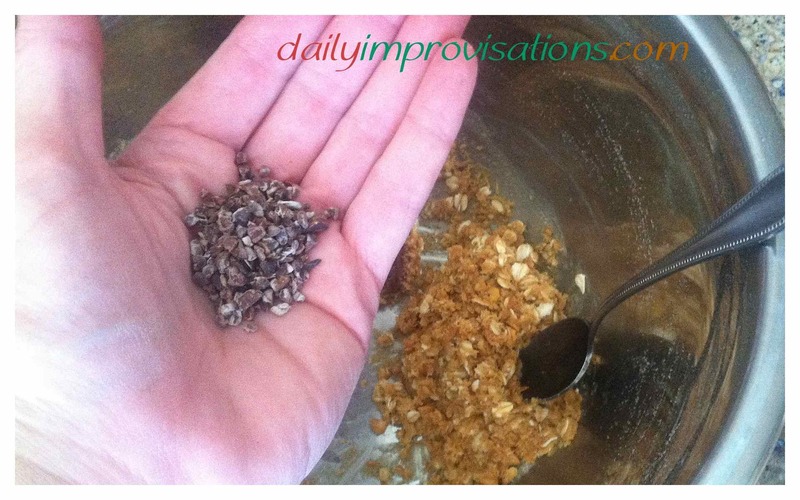 When I was down to about 1/2 cup of snack ball mixture, still not made into balls, I added pretty close to 1 tablespoon of cocoa nibs. 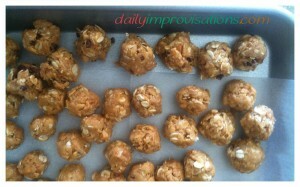 Of course, I had to try one right away, only to discover that I wished I had put them in all the peanut butter balls! They were not bitter at all. They weren’t even overtly chocolate flavored, but there was a slight nutty, barely chocolate essence that added a lot to the snack ball. If I remember correctly, they are a bit on the expensive side, so I may try finely chopped dark chocolate next time. The original recipe calls for rolling the balls in powdered sugar, presumably to help with the greasiness, but I skipped that step and don’t think it made much difference. 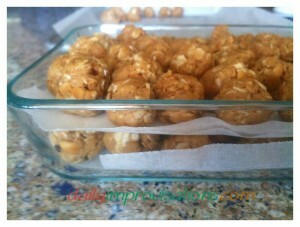 I did have a higher ratio of dry ingredients in my recipe, so that may have helped. It was an all around success and I hope you will make some. 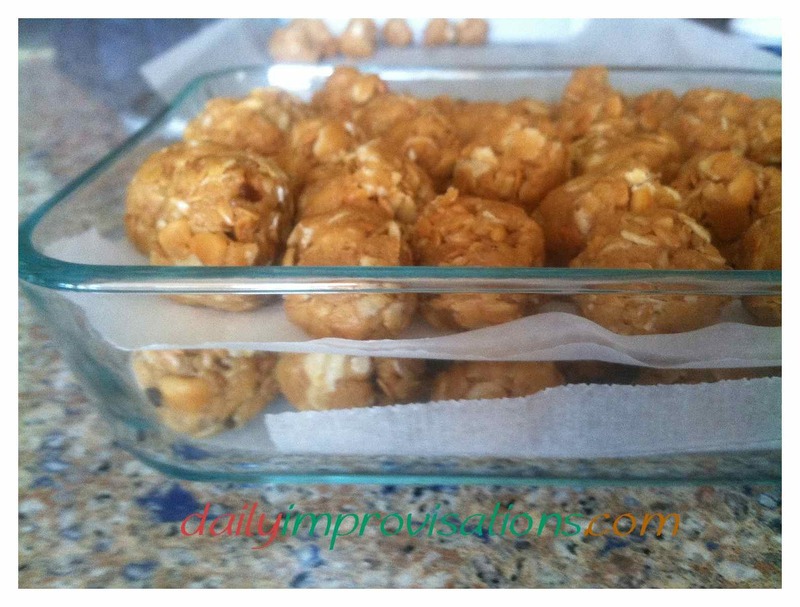 Peanut butter snack balls layered with wax paper to keep them from sticking together while in the refrigerator.